20 years of Google - what would we do without it? So, Google is no longer a teenager. Today it celebrates being 20-years-old having been incorporated on 4th September 1998. Its gestation was long, having initially been born in January 1996 in a Californian garage. Indeed, Google may never have made it had it not been for the “midwifery” of Amazon’s Jeff Bezos who was one of the first three investors in the fledgeling business. Back in 1998, the dominant search engines were Yahoo!, Excite and AltaVista. You might also have used “America Online (AOL)” or “Ask Jeeves”. Remember them? Search was much more fragmented back then. Now, Google is dominant with 80% of us relying on it as our primary source of information. And therein lies a problem. Many people assume that what Google provides them with is the best information on the topic in which they are interested. But that is not necessarily the case. For instance, back in the late 1970s, early 1908s, I worked at Polydor Records in London. So if you look up “Polydor Records history” on Google, you find that the top result is a Wikipedia page. Fair enough, you might say. However, as someone who was there at the time, I notice a couple of errors in that Wikipedia page. Sure, I could correct them and add information which is pertinent. But the issue is that anyone reading that page is slightly misinformed. Further down the Google results is a link to a website that provides record industry news. It contains a potted history of Polydor which is factually incorrect. Here’s the problem: you wouldn’t know unless you were there at the time, working for Polydor records. Before Google, how would you have researched the history of a record company? The chances are you would have asked people – particularly the people who were working for the company. Nowadays, we don’t ask people; we ask Google. And Google does not always provide the right answer – yet most people default to believing that Google does offer the correct answer. 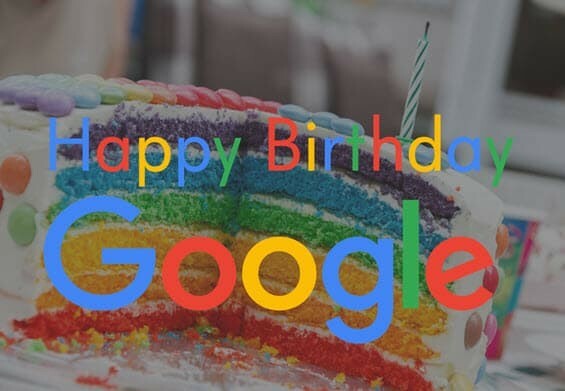 Indeed, this morning when I was trying to produce the “Happy Birthday” image (above) I searched on Google for the name of the font it uses in its logo so that I could add the words “Happy Birthday” in as close a font as possible. However, Google’s own search engine provides false information about its own font and logo. It leads you towards pages which are just plain wrong. And that’s in the Top 10 results. The best information on the font presumably is from Google itself, and their own page about their font does not appear until the second page of the search results. If, though, Google were not a search engine and there was no such thing as online search, how would you have known the typeface used by a company in its logo? Well, guess what, you would have spoken to a person. You would have either called Google itself to get the answer, or you would talk to someone you knew in the world of graphic design. Even if they didn’t know themselves, they’d know who to ask. For all their convenience, Google and other search engines are flawed. They do not always provide us with the best answers. Nor do they always tell us the truth or give the highest degree of accuracy. Of course, that was true before the Internet came along. Books have been published for centuries with inaccuracies and factual errors. So too have research journals and reference documents. However, we would have often cross-checked one source against another. Plus we would have always asked, “people in the know” – individuals with experience or specialist knowledge. Sometimes these would have been the local librarian, at other times it would have been an expert in the field. If we couldn’t contact such people, we would ask someone, such as a colleague or neighbour or friend who would know someone who would know the answers we wanted. In other words, whatever we were trying to find out, we relied a great deal on other people. And they, generally, would know if the printed material we had been looking at was reliable. Now, we treat Google as that arbiter of the truth. We expect Google to have done what our personal contacts did in the past – know the truth or know who was telling the truth. Sadly, that is not the case. Google is not a person, but an algorithm – and a relatively weak one at that. According to Moz, the search engine optimisation firm, only two-thirds of searches result in a click. In other words, for one in every three searches we do, Google doesn’t provide anything we find useful. Furthermore, of the two in three people who do click on a search result, 80% of them return to Google for another search within 10 seconds. That suggests they have discovered that the results Google provided were not what they wanted. In total, what this means is that 86% of searches result in failure; they do not provide what we wanted. Google will say that this is because of poor search behaviour. But that is asking us to think like engineers, using “boolean” logic and the like. There is much criticism of the quality of search results. Indeed, five years ago I questioned the validity of Google’s search engine. Google, though, is not daft. The company realises that its search quality needs improving. Indeed, it has recently contracted 10,000 individuals to work on improving the quality of results. That’s an admission that people are better than its algorithm. Why do we rely on Google? The problem is, Google is such a fantastic “magic trick”. It can find tons of information in a blink of an eye. That makes it hugely convenient. Plus it does provide us with exciting and engaging stuff. In fact, Google is providing us all with such an illusion it is bending our minds. Convenience and instant gratification beat having to get in the car, travelling to the library, paying for parking, walking down the road in the rain, trawling through several books, making notes and then going back to the office an hour later. With Google, we can avoid all that, stay in the warm and get the answer in seconds. Or at least we think so. The problem is, the answer may not be as accurate as what we would have obtained from the library and the librarian. In other words, we have traded accuracy for convenience. The convenience, though, comes at another price – bias. Recently, President Donald Trump accused Google of bias, suggesting it was distorting its search results to provide negative news about him at the top of its results. No doubt, that’s what Mr Trump sees when he searches for his own name. Google’s results are always biased. They depend upon a combination of your search history, the computer you are using and your click history. Mr Trump probably keeps searching for his own name and then clicking on those “fake news” stories just to see how badly he has been treated. Google’s algorithm, in turn, goes “we’ll provide that computer with more of this stuff because that’s clearly what they like”. Five years ago, the BBC pointed out that search results are not always accurate. Yet even though we know that, we continue to use search engines because the convenience reigns supreme in our subconscious. Without Google, we’d feel as though everything is taking longer. Except it might not be. One trip to the library to gain highly accurate information or a couple of phone calls to contacts to do some research might seem it is all taking time. The convenience of Google makes us think we can do the same in a blink of an eye. But that is not true. We search on Google, find the wrong results, search again, go back again, search for something else, get distracted and eventually get the information. That can take longer than going to the library. It seems, however, that it is quicker. That’s because search involves us in “activity”. We are constantly doing something – typing, reading, clicking. It all makes us feel as though we are “working”. Going to the library seems as though we are wasting our time because all we are doing is driving or sitting on a bus. Search engines make us think we are working, when, in reality, they are contributing to decreased productivity at the same time as increasing the amount of weak information in usage. Productivity down, accuracy down, feeling as though we are working up. Amazon is getting into healthcare: healthcare may… In a new report, L.E.K. Consulting describes five healthcare-industry scenarios that show how Amazon is likely to enter and dominate the field. The Everything Store This is the fascinating story of how Amazon has succeeded. Another great thought provoking post Graham. Thank you. It made me think. I’ll check over the next few days, but my sense is that my use of Google must be significantly better than average. I cannot recall the last time I did NOT find what I wanted with my first google search. I appreciate how averages work of course, but I wonder whether the stats provide the full picture. Thanks for your comment, Mark. Yes, for some people they do get what they want the first time. But that’s often due to them being “expert” searchers, using AND/OR techniques or using double quotation marks etc. So, your use of Google may well be better than average. However, the fact you cannot recall something does not mean it did not happen…..! Your memory is also biased, removing negatives from your consciousness. So you are much less likely to remember when your searches go wrong than when they go right. That’s another part of the Google “magic trick” – when it doesn’t work you are less likely to remember that, meaning you get the illusion that it is all perfect…! I agree, though, stats never provide the full picture. Yesterday, for instance, the Government was busy promoting an online test to work out your “heart age” saying that 78% of people had a “heart age” older than their chronological age. Well, everyone’s heart is already about 9 months older than their chronological age anyway as it is one of the first things to develop in the womb. Plus, they were using the stats to help us all reduce our risk of dying. But I have news for the Government: everyone’s risk of dying is 100%. Lies and statistics…. !